As part of our trip to Ireland exploring the country’s Ancient East, we stopped in Waterford for a couple days. I didn’t know much about the city before visiting but I’ve definitely heard of Waterford Crystal so it was a fun surprise to discover the House of Waterford Crystal headquarters and crystal production factory in the center of town! We took a guided visit of the factory and before going in, I really didn’t have high expectations. Crystal was something I associated with my aunt who had lots of fine china and crystal pieces in this giant mahogany display cabinet. But I was really blown away by the tour! It was definitely one of the highlights of visiting Waterford, Ireland and I wanted to share a little bit about our guided visit of the House of Waterford Crystal and some interesting facts we learned about Waterford Crystal production. Keep reading to learn about what our tour entailed and some fun facts about Irish crystal production! 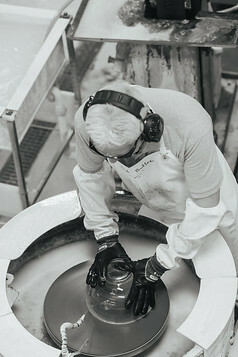 Waterford Crystal is a centuries old tradition. Waterford, a bustling port city even during ancient Ireland times, was a thriving commercial center for shipbuilding, ironworks and cotton factories. There was a huge supply of timber from Ireland’s thick, ancient forests and Irish crystal manufacturers were exempt from luxury taxes imposed by the English parliament. All of these conditions helped pave the rise of Waterford Crystal, beginning in 1783. 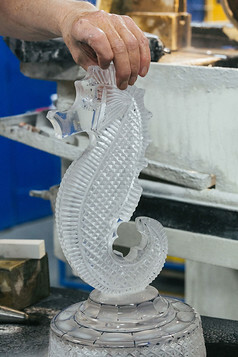 The guided factory tour started off with a glitzy, unique film and a look at some of the most luxurious examples of Waterford Crystal. 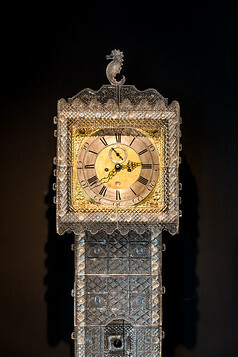 There was this insane life size Waterford Crystal clock and blinged out trophies from almost every famous sports event you can imagine! 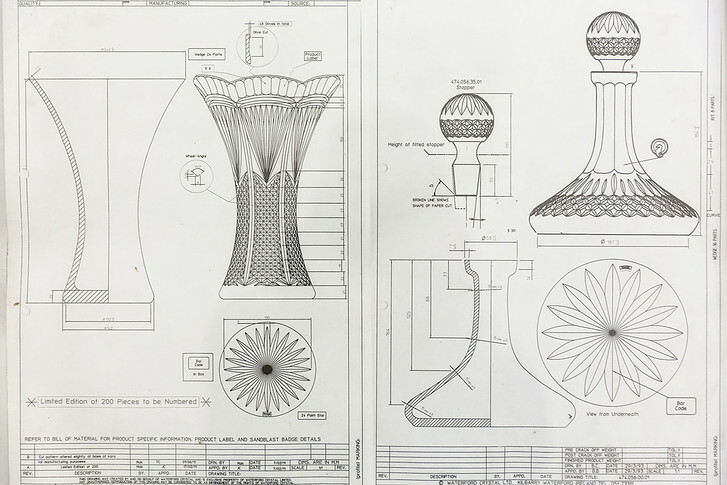 You can see a diagram of a Waterford crystal wine decanter and crystal vase below. 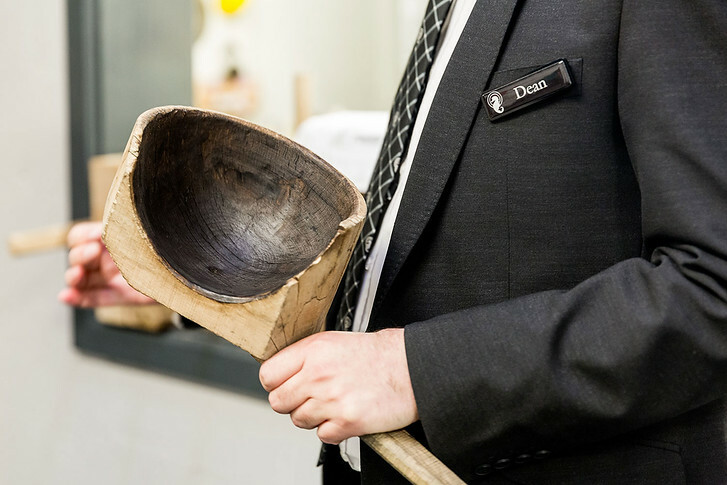 Next, the factory tour showed a snippet of each step of traditional Waterford crystal production, from the development of wooden moulds to shape the glass, to a live demonstration of crystal blowing. 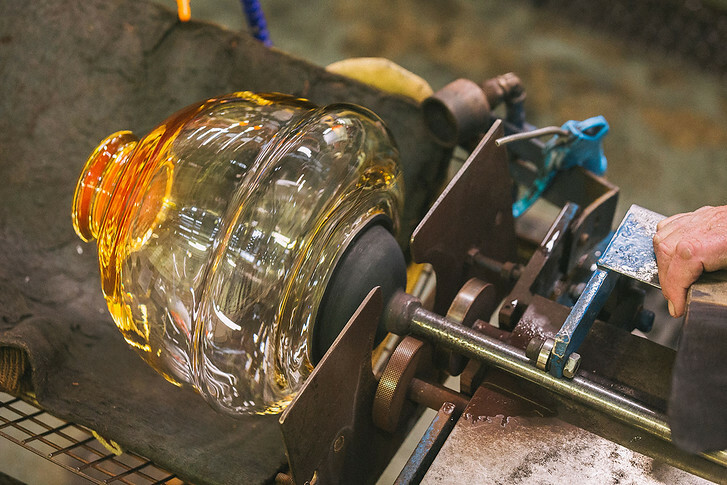 One of the most popular crystal gifts is to give a Waterford Crystal vase and so we saw 4 glass masters heating glass in giant furnaces and shaping the beginning of the round vase base. Because we were on a private media tour, we got to linger and watch the glassmakers for a bit. A couple of us with strong lungs even gave blowing the glass a try! Today, the furnaces run on electricity but in the past wood, oil and gas were used. 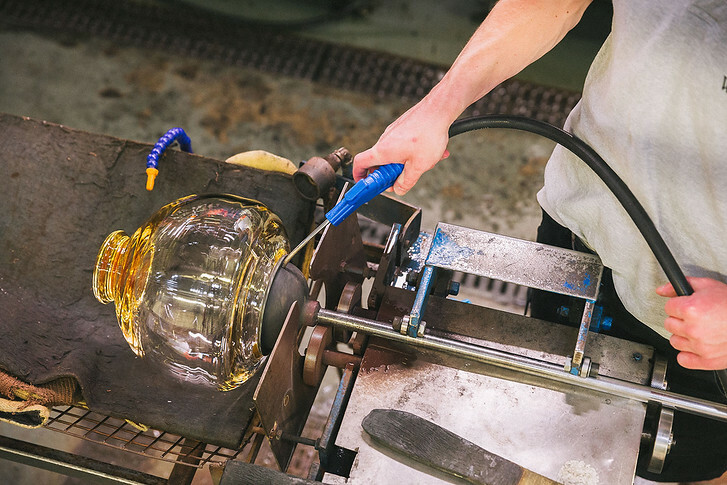 It takes up to 2 weeks to heat the furnaces high enough to meet the temperature for creating Waterford crystal. If there’s a loss in power for over 20 minutes, it can throw havoc into the production schedule! 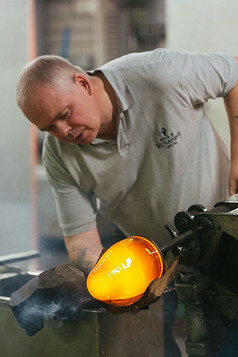 I hope they survived Hurricane Ophelia all right..
Waterford Crystal has made such a name for itself, not only in Ireland but worldwide, that no new patterns were introduced or advertising used throughout the 1970s. It was only once Waterford acquired a new retail and distribution channel in the 1980s that they began introducing new crystal patterns such as the insanely popular Marquis by Waterford line. For the Year 2000 New Year’s Countdown, Waterford Crystal launched their most successful crystal champagne flute ever. The brand’s logo is a seahorse today, but was originally a dolphin (after the Waterford city coat of arms animal). The dolphins tail was shaped backwards to create an Irish shamrock shape and then switched to a sea horse. You can see a glass version of it in the beginning photos of this post. 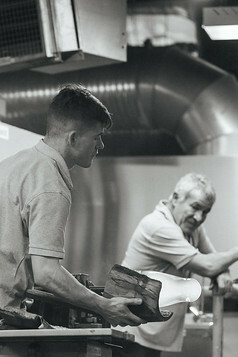 As part of the crystal apprenticeship, students must learn how to blow, cut, draw and engrave. 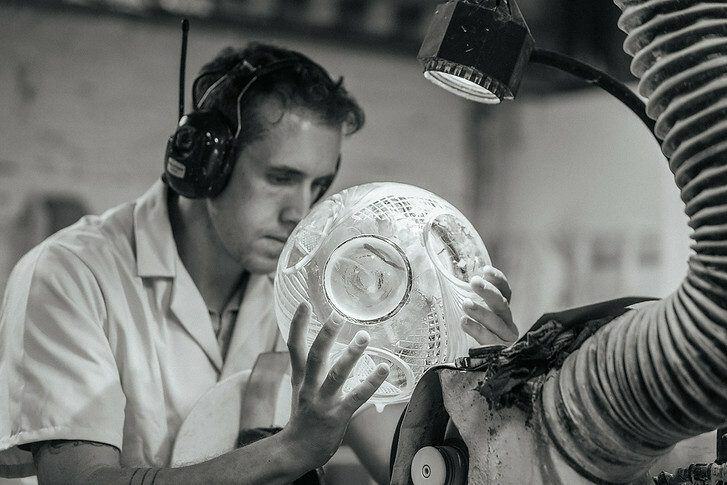 Each year of instruction has a final test where each apprentice must create a Waterford crystal bowl with a defined crystal pattern. More advanced students learn more intricate crystal patterns! 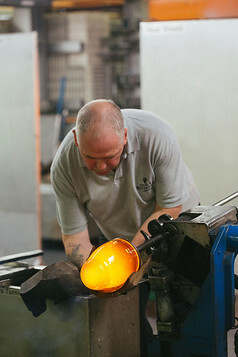 Next, we moved into the cutting room where Waterford’s glass masters create the distinctive brand patterns. Crystal vases are firmly pressed against the cutting machines to create slashes and multiple criss-crossing slashes can form pretty Waterford Crystal patterns when all added up! 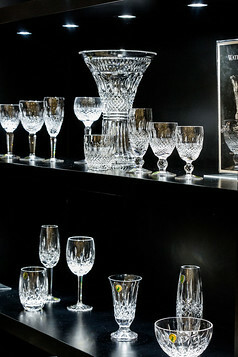 Definitely make sure to check out Waterford Crystal’s exhibition shop and retail store when visiting Waterford, Ireland. 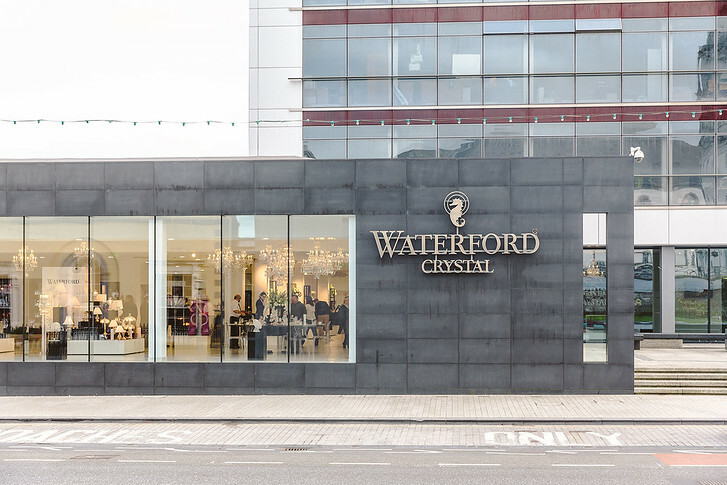 There’s an on site coffee shop and car parking available and of course, a big highlight is seeing the largest collection of Waterford Crystal in the world, including sporting trophies and statement pieces! 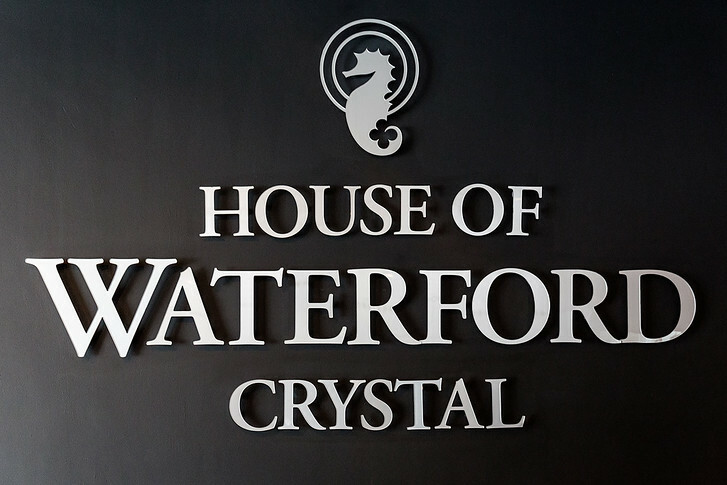 Reserve tickets for the House of Waterford Crystal guided tour here.